Earlier this week, I checked my Facebook notices. I generally skip the "memory" notices. Those are the ones meant to remind us of posts we've made on this date in years past. One, however, caught my attention. There it was. Seven years ago on this date, I spent the day in Manhattan, in front of 50 or so journalists at the CUNY Journalism Graduate School, recently renamed the Craig Newmark Graduate School of Journalism at the City University of New York. "Why was I there," you asked? To discuss digital journalism. 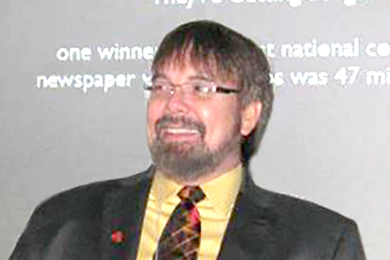 Beginning in the late 1990s, I began receiving requests to speak about the future of digital journalism at conferences and schools of journalism throughout the US and Canada. Large audiences would pack rooms as I discussed online video, vodcasts, podcasts, slideshows, hardware, software and more. Like a lot of folks, I was enamoured with the technology. I loved teaching folks how to use the software and gadgets needed to record and get videos online, create newspaper websites, and most of the hardware and software companies were more than happy to send me free samples of their products, in hopes I might include them in reviews. Like a lot of folks, I was giddy with thoughts of how the internet was going to change the newspaper business. At the time, we anticipated converting our print publications to digital publications, assuming readers would gladly switch from paper to screen. We also assumed advertisers would be just as thrilled with the possibilities of digital media, and gladly pay hefty sums to fund our journalistic efforts. It didn't take long to realise print wasn't going away, at least not as quickly as we anticipated back in those heady days. It was tempting to ignore the facts and move full-steam ahead into the digital era, leaving print behind. Most of the folks I know who took that approach aren't in the news business any more. Most healthy papers came to realse the newspaper business isn't an either/ or proposition. For most newspapers, it became quickly evident that digital advertising dollars couldn't sustain their publications without a serious reduction in staff and other resources. Sure, there's the Wall Street Journal and New York Times, but those are exceptions to the rule, not the rule itself. As recently as last week, a publisher of a very successful community paper emailed me to let me know he was significantly reducing his newspaper's digital emphasis. In his words, he put pencil to paper and came to the conclusion there was very little financial return based on the number of hours his staff was putting into their website and social media presence. I still visit a lot of community newspapers, both dailies and weeklies. What I'm seeing is no increase in the digital efforts at most newspapers, especially community papers. Most have a website, with highlights of news. Most have a paywall for readers who want to see full stories. Most engage with social media, primarily Facebook and Twitter, to promote stories, share late-breaking news and attempt to draw readers and subscribers. In the past, I noticed the majority of the publishers I visited felt like they were missing out on something. There was a feeling that "everybody" else had a handle on the whole digital thing, yet they were somehow left behind. This seems to be another area where time seems to alleviate many of our misconceptions. Sure, newspapers still try to determine the right "mix" of print and digital efforts. Metros and other dailies might have a hard time existing without income from their online presence. Most - notice I wrote "most" - community papers have come to the conclusion that digital media isn't going to be their saviour, at least not anytime in the near future. So they offer online subscriptions. They get a little income, usually not much, from online advertisers. They use social media to promote print subscriptions. I've seen a few community newspapers make significant income by livestreaming area high school ballgames and other events, with sponsorships from local advertisers. It's becoming more common, as I visit community papers, to see live broadcasts of news or newsmakers, usually on a daily or weekly basis. In many cases, the focus of the effort is to enhance what is happening in the local newspaper, not replace it. Do I think print will totally give way to digital in the near future? No, as I first wrote ten years ago, print is going to be around for a long time. Do I think newspapers will give up on digital efforts? No, of course not. Heck, even the cupcake shop down the street has a website. It's a normal part of business. Then what do I think is going to happen? I think newspapers will continue to look for ways to incorporate digital efforts in ways to enhance their current products and, as time moves forward, find even more ways to benefit from their digital presence. It's my educated guess that we will continue to search for ways to benefit from the digital side of our business, without throwing out the products that still bring in the most revenue and reach the widest audience. Just a reminder: In the latest Newspaper Institute survey of US and Canadian newspaper publishers, more than 90 per cent indicated print advertising is still their number one source of income. What was number two? Print subscriptions. Income from digital sources came in at a little under one per cent of respondents. So here's my advice: Keep putting out a great newspaper. If it's not great, figure out how to make it better. Look for ways to use your digital presence to increase readership and advertisers, but don't think they will replace income from your most profi table product. You're not alone. Just about everyone is still trying to figure this digital thing out. Look at me. I started writing and speaking about digital news more than 20 years ago, and I'm still trying to figure it out. Pictured: Kevin Slimp at CUNY Graduate School in 2011.